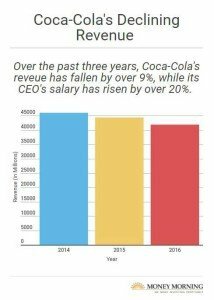 Coca-Cola Co. (NYSE: KO) CEO Muhtar Kent snagged an outrageously high bonus last year, even though the beverage distributer reported less than stellar financials. In fact, Coca-Cola's revenue slid by almost 6% — from $44.3 billion in 2015 to $41.8 billion in 2016. And its profits fell by over 11% — from $7.3 billion in 2015 to $6.5 billion now. Even worse, the Dow Industrial blue-chip stock has fallen more than 8% over the past year. Yet Kent took home over $3 million more than he did in 2015 – an increase of over 20%. His pay included a $1.6 million salary, $9.5 million in stock-based pay, a $4.1 million bonus, and $792,414 in perks such as personal use of company aircraft. The reason for the huge payout: Coca-Cola claimed Kent received the extremely high bonus for "individual performance" in a proxy statement on March 9. You see, its biggest proxy advisor, Institutional Shareholder Services Inc. (ISS), is strongly opposing the compensation package. It's urging shareholders to vote "no" to Coke's executive-pay practices at the upcoming meeting on April 26. "Discretionary assessments have led to overall pay increases amid a period of flagging share price and underwhelming financial performance," ISS said, according to an April 6 report by The Wall Street Journal. The firm pointed out that most performance measures declined for Coke in 2016, including shareholder return. 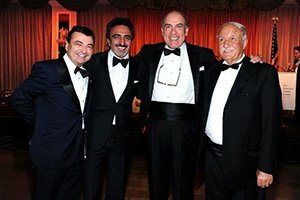 In fact, Money Morning Capital Wave Strategist Shah Gilani – who specializes in revealing Wall Street elite's scheming and dealing – exposed the preposterous compensation of top CEOs after the financial crisis of 2008-2009 to Members. You see, the companies that accepted government bailout money during that time still "managed" to reward their top talent with over $18.4 billion in cash bonuses. "The fundamental question that needs to be addressed is straightforward," said Gilani. "Are these executives worth what they are paid, given the risks they take with money that actually belongs to shareholders?" Jesse James would be impressed.